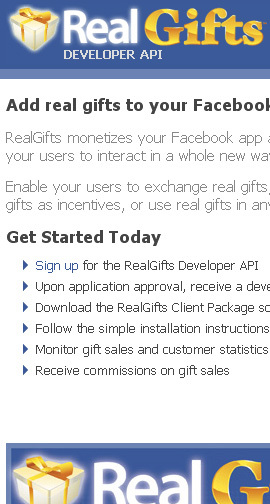 This API allows people to monetize their Facebook app by adding this RealGifts widget and then earning commissions on gift sales. I made a sign-up form for application. Once approved, I created a unique developer key and login credentials that identify the user so they can then implement RealGifts on their site. I also wrote the easy-to-follow installation instructions. I created the client package in PHP which allows them to send client information to RealGifts' servers. I also had to make a RESTful web service (server-side listener) to receive that client-side information and then process the order and send a transaction confirmation back to the user. The data is formatted in either XML or JSON.